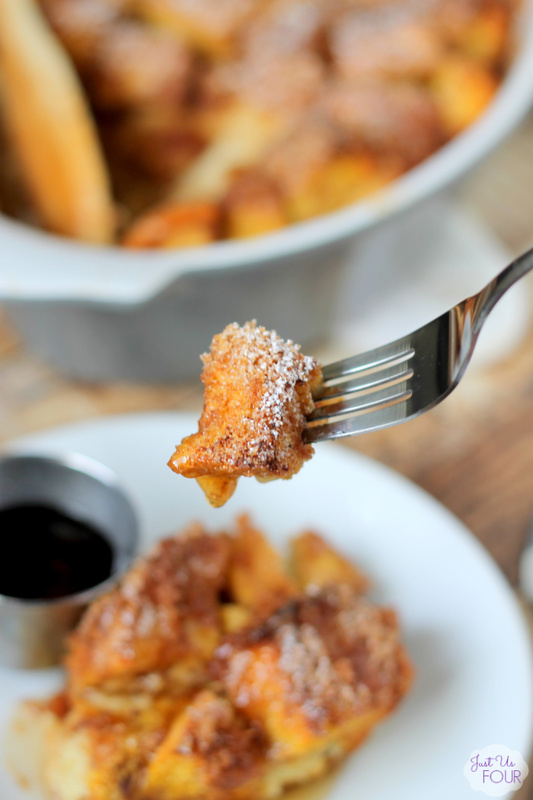 A little bit of prep work in the evening creates this Overnight Pumpkin Pie French Toast. Wake up to a delicious breakfast that bakes while you sleep! Welcome to September! I had to laugh when I saw a something on Facebook that referenced how everything would turn into pumpkins come September 1st. I know, as a blogger, we start thinking in pumpkin terms around mid-July so we’ll be ready but I always wonder if everyone else gets annoyed by pumpkin so early. So, I asked on Facebook what you guys would prefer to see today and Overnight Pumpkin Pie French Toast beat out the competition! 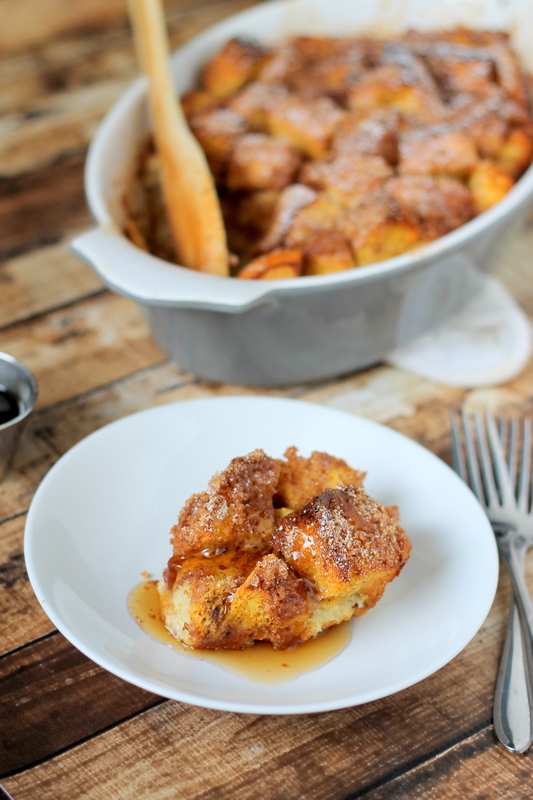 I originally made this pumpkin french toast to serve on holiday mornings. It quickly became a favorite though, so I will make it throughout the year for my family to enjoy on the weekends. For holidays, especially, being able to put it together night before and then just cook in the morning makes a huge difference. 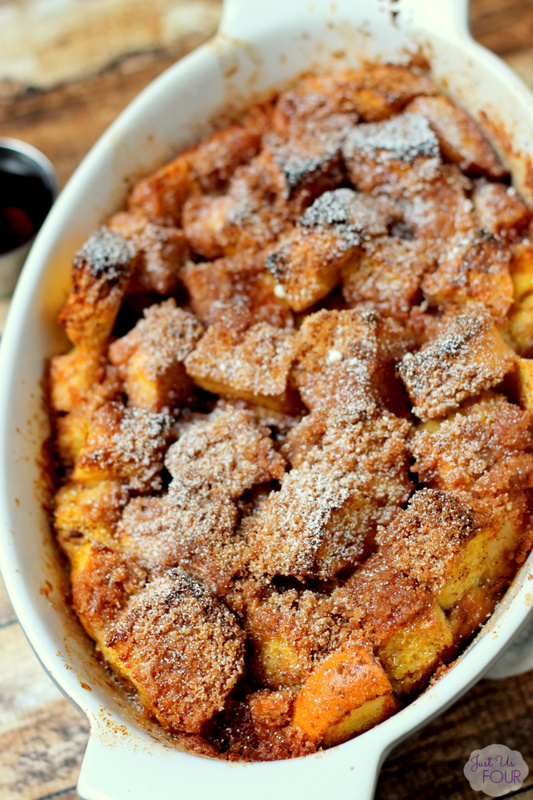 We open presents on Christmas morning and it is amazing to smell this overnight french toast casserole cooking while we sit around the Christmas tree and enjoy family time together. 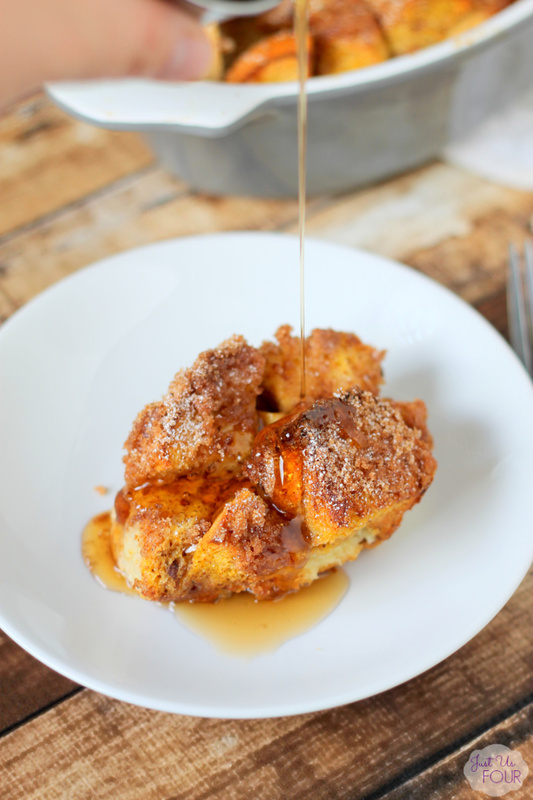 This baked french toast recipe tastes amazing with maple syrup! You can also top it with chopped walnuts after baking for an extra hint of fall. The combination is really delicious. The kids love it dusted with a little bit of powdered sugar instead of syrup. What are some of your favorite fall breakfast recipes? Do you love overnight options that make a delicious breakfast super easy to make because all the work is done beforehand? Cut the French bread into 1 inch pieces and place in 9x13 baking dish lightly coated with cooking spray. In a large bowl, combine eggs, half and half, milk, pumpkin puree, pumpkin pie spice, brown sugar and salt. Whisk to combine. Pour over bread pieces and gently mix to ensure all of the bread is coated with egg mixture. Cover the dish and refrigerate overnight. Remove French toast from refrigerator and uncover. Preheat oven to 350 degrees. Combine the brown sugar, white sugar, pumpkin pie spice and nutmeg for the topping in a medium bowl and stir well to combine. Cut in butter pieces to create a crumbly topping. Sprinkle topping over bread mixture. Bake in preheated oven until top is golden brown and middle is set; about 50 minutes. I recommend lining your pan with parchment paper for easy clean up but that is totally optional. I’ve made this recipe multiple times and it’s alwsyd a hit with overnight guests or for brunches. Thank you for sharing! I am so glad it has been a great recipe for you! Hola Angeline; hoy he descubierto tu blog y me he suscrito porque me encanta. En hora buena! Hi – A pint is a measurement. Half and half is the ingredient and it is a mixture of milk and cream (half milk and half cream). I think it would be translated to mitad y mitad.